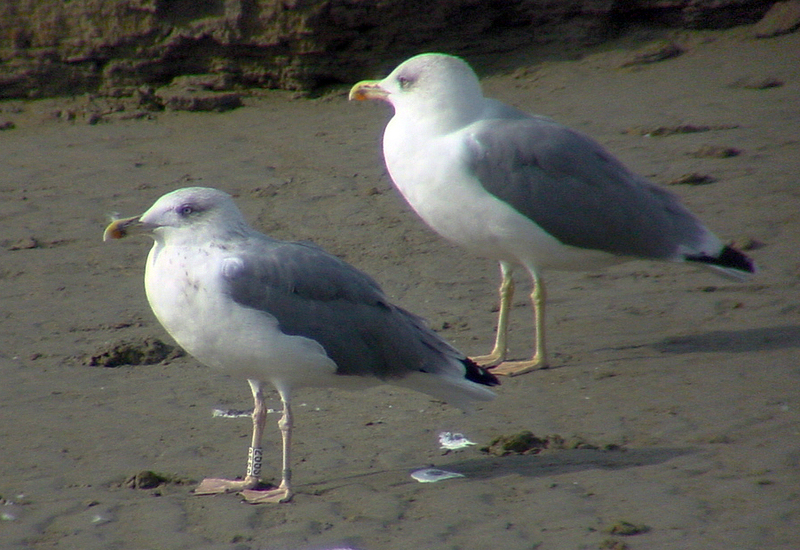 Yellow-legged Gull michahellis 2CY-4CY 255S July 27 2001, September 21 2002 & August 08 2003, Etaples, NW France. Ringed white right 255S and hatched in the Camarque, year 2000.
below: 255S michahellis 2CY, July 27 2001, Etaples, NW France. Tertials at least #1-5 full-grown. Greater coverts #1 fresh with ginger tone, #2-3 slightly bleached. Median coverts #1 fresh with ginger tone, #2 missing, #3 to outer-wing full-grown and some central medians slightly bleached. 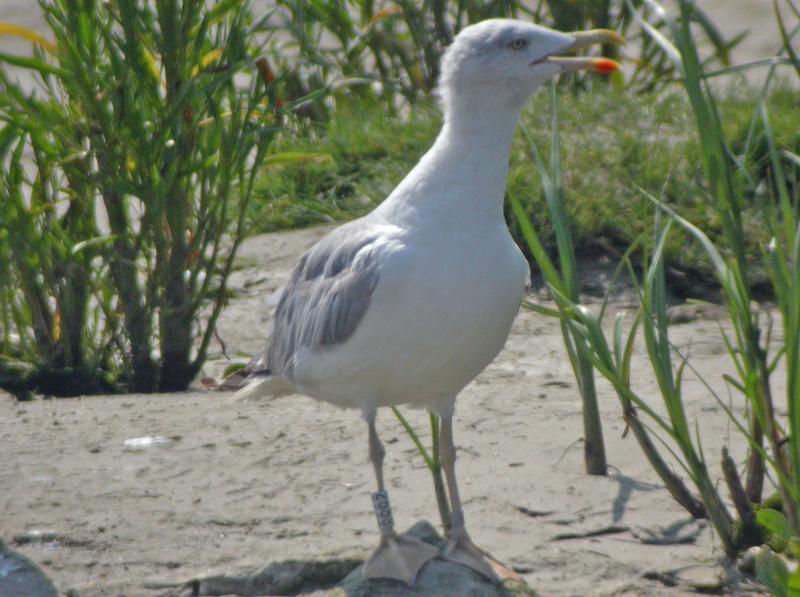 Active moult in the lesser coverts. Scapulars fresh grey, some upper scapulars missing. P6 full-grown, p7 longer than p6 and p10 juvenile. below: 255S michahellis 3CY, September 21 2002, Etaples, NW France. 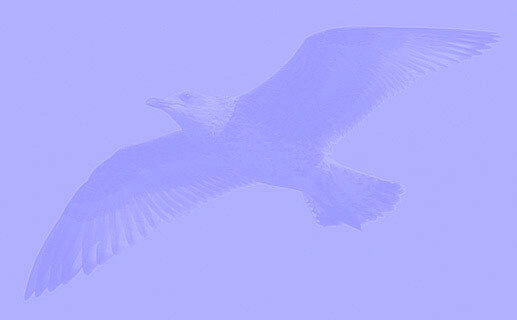 255S is a remarkable advanced coloured bird, being all grey in the scapulars and wing-coverts as 3CY michahellis. Note the fire-patterned sub-terminal band in the third tertial and the brownish wash on the inner median and greater coverts. 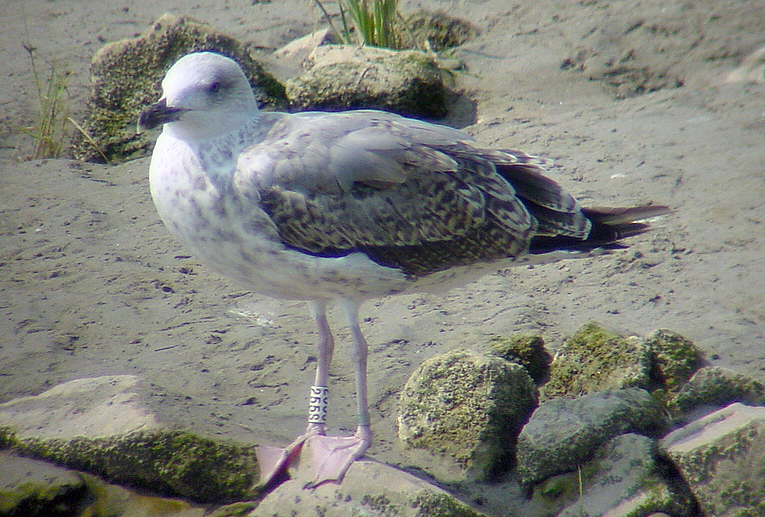 The bill is obviously sub-adult, the legs are rather whitish yellow and the iris is very pale as well, slightly pigmented. below: 255S michahellis 4CY, August 08 2003, Etaples, NW France. Picture Ruud Altenburg. 255S with mirror on old P10. No obvious black on the bill.